You can see multiple downtown Tucson development from atop the Pennington Street Parking Garage. The Ronstadt Transit Center (foreground) is in the crosshairs for future development. At the Feb. 19 study session and evening meeting, the Tucson City Council will consider two issues that could greatly affect bus service in our town. Mayor and Council will hear staff presentations and consider a new proposed Fare Policy as well as Sun Tran service changes based on last fall’s Comprehensive Operational Analysis. Come on down to City Hall, 255 West Alameda Street. The study session starts at noon; these items could come up any time but likely 2pm or later. Ronstadt Transit Center: Community Space or Capitalist Dream? Ronstadt Center Re-Development: When Is a Public Process Not Public? 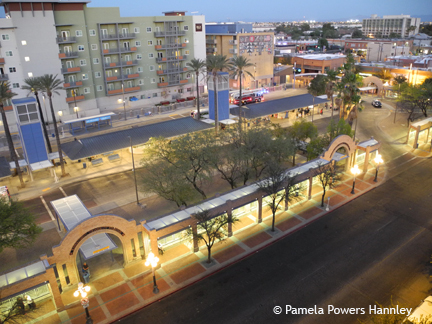 This entry was posted on February 18, 2014 by Pamela Powers Hannley in City Council, democracy, downtown, Economics, environment, Jonathan Rothschild, Karin Ulich, Paul Cunningham, Regina Romero, Richard Fimbres, Shirley Scott, Steve Kozachik, sustainability, Tucson and tagged Bus Riders Union, Ronstadt Transit Center.